From left: Emerson Kington, technical director for the orchestra; Jo Frances Meyer; Peter Fiedler; Gene Dahmen; and music director Christopher Wilkins. 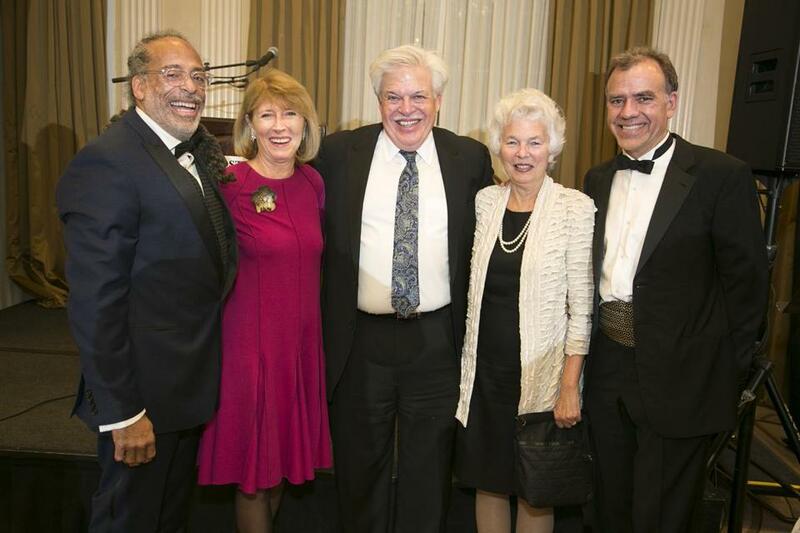 The Boston Landmarks Orchestra Gala at the Omni Parker House Saturday evening raised money for its annual free summer concert series at the Hatch Shell. Lloyd and Gene Dahmen and Peter and Dieuwke Fiedler were co-chairs for the event. Welcoming guests were Landmarks executive director Jo Frances Meyer and board chair Laura Connors . Mayor Martin J. Walsh introduced James D. Gallagher , executive vice president and general counsel for Manulife Financial, who leads John Hancock’s MLK Scholars Program. More than 200 guests enjoyed a performance by the Boston String Academy and a memorial video tribute to Robert Honeysucker .